SCDT’s director Jennifer Polins collaborates with local sound artist Jake Meginsky to curate a new performance series that combines local and international artists of different genres in a performance event. 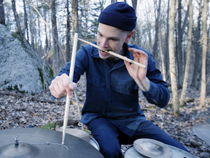 This month HUT V features Katie Martin- Choreography, Jacob Fried- Experimental Animation, Chris Corsano- Solo Percussion. Join HUT for an afterparty with DJ at sevenstrong. This season is funded by the Northampton Arts Council. Jake Fried began his artistic career as a painter, but as he went through the process of layering and modifying images, he realized what truly interested him was the way the images metamorphosed in the course of making a painting and he changed tracks to become an animator. In recent years his films have been widely shown internationally, including at the Tate Modern, Sundance Film Festival and on Adult Swim. Fried works with ink and white-out, sometimes adding gouache, collage and even coffee to generate hallucinatory vistas, modifying and shooting the images over and over to create mind-bending animations that evolve at a frenzied pace. He currently teaches at the Massachusetts College of Art & Design and the Museum of Fine Arts, Boston. Katie Martin will present new work with renowned dancers Paul Matteson, Jennifer Nugent and Kate Seethaler. Martin is a choreographer, performer, teacher, and recipient of the national Jacob K. Javits Fellowship in Dance. Katie has presented and performed her choreography nationally, including Joyce SoHo, New York Live Arts, Danspace Project, Symphony Space, the Experimental Media and Performing Arts Center (NY), The Neurosciences Institute (CA), the New England Complex Systems Institute (MA), the Flynn Center for the Performing Arts (VT) and A.P.E. Gallery (MA), as well as at numerous college and university performance venues. Her work has been supported by such organizations as the Massachusetts Cultural Council, Vermont Arts Council, Northampton Arts Council, and the Bumper Foundation and has been honored at the American College Dance Association’s Gala Concert and selected for the National College Dance Festival at the Kennedy Center (DC). Katie lives in Northampton, Massachusetts where she is a guest artist and on the dance faculty throughout the Five College Dance Department.